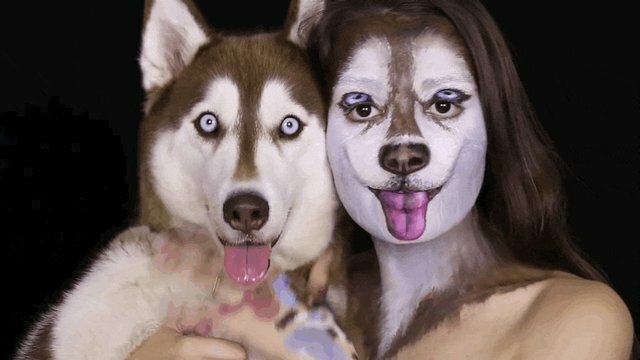 An online makeup artist just found the perfect technique to freak everyone out. 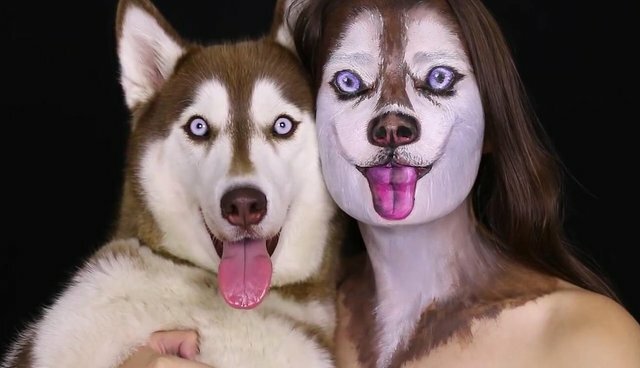 Ilani, an Israeli makeup artist, posted a YouTube tutorial on how to make yourself look like a Siberian husky and it's no surprise that the process takes time. Her diligence paid off because, upon completion, Ilani and her dog mirror each other. 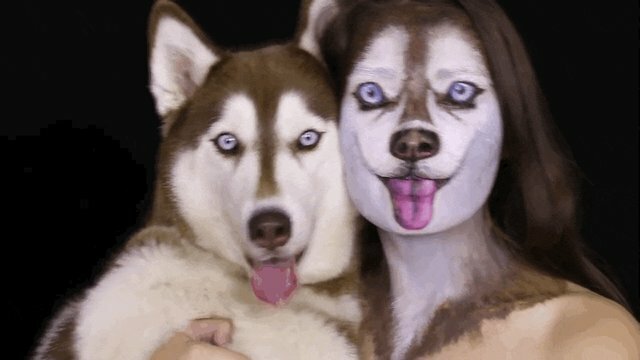 Here are Ilani and her husky, who could be twins at this point, panting. 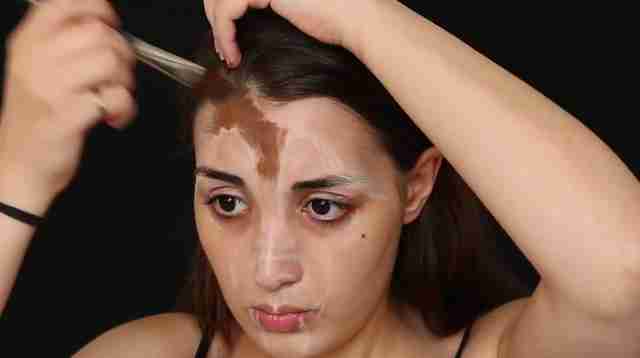 "Why would anybody do this?" you might ask. Well, it should be perfectly obvious. 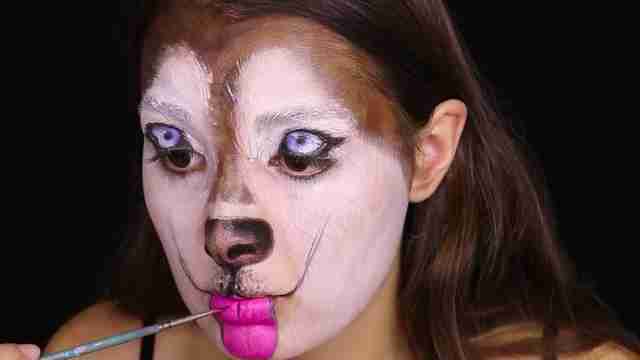 When you look like a dog, you can get away with a whole lot more than humans can. You can howl at the moon or get free treats at the bank. Just don't open your eyes. You'll freak everyone out and totally blow your cover. 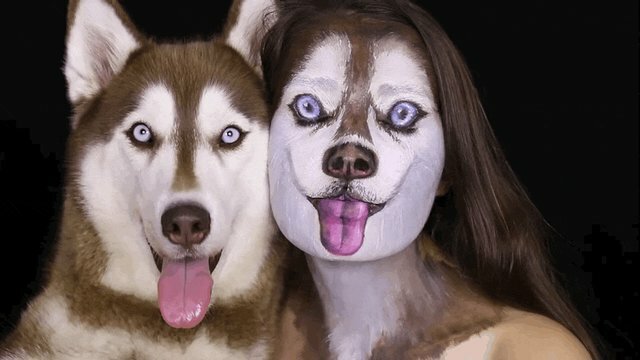 But a husky isn't the only animal mask that Ilana paints. Below are a few selections from her Instagram. Ilanað»ðð on Instagram: "×××¨××ª ×¦×××¨ ×¤× ×× ×©× × ××¨ ×¢×× ××¢×¨××¥ !!!! ×§××©××¨ ××¢×¨××¥ ××ª×××ª ×××××¢ ×××¢××!ð¯"
Ilanað»ðð on Instagram: "×× ×©×¢×××× ×× ×¨××× ××ª ××¡×¨×××, ××§××©××¨ ××¢×¨××¥ × ××¦× ×××××¢ ×××¢××!! â¤â¤"
Ilanað»ðð on Instagram: "×××©×× ×× ××© ×××× ×¡×¨××× ××¢×× ×××¨ ? ×× × ×××© ××ª×¨××©×ª!! ××ª× ×©×××¨ ×ª×¨××ððð"
Ilanað»ðð on Instagram: "My version of the Cheshire cat makeup on myself ðºðð¸#cheshirecat #makeup #alicemadnessreturns #specialeffects #facedrawing #art #makeupart..."
Ilanað»ðð on Instagram: "#cheshirecat #makeup #bodyart #specialeffects #art #scary #alicemadnessreturns"
Ilanað»ðð on Instagram: "My Davy Jones makeup on myself ð"
Ilanað»ðð on Instagram: "×¡×¨××× ×××© ××¢×¨××¥!! !×××¨××ª ×¦×××¨ ×¤× ×× ×©× ×××××××ªððð×§××©××¨ ××¢×¨××¥ ×××× ×××¢×× â¬â¬ð"
Whether you're using your painted-on dog mask to pee on a hydrant or to scare the living daylights out of the neighbors' kids, here is the full tutorial for making yourself up like a Siberian husky.